A recent report by the Intergovernmental Panel on Climate Change (IPCC) is shocking – the climate change mitigation goals set by governments have been far too optimistic, and even more proactivity is needed than has previously been held. This is shocking not because it is news, but because many governments have until now not been able to fulfil even the targets that have been set so far – it seems more than ever that time is running out. A serious amount of tangible horrors await us: The increased occurrence of storms that ravish entire regions and destroy lives. The escalation of lurking conflicts over finite resources, over the right to clean water, over land that has not yet been flooded, or that has not yet dried out. Conflicts over what fish are still left in the sea, and over territory that has not yet been exploited. What awaits us is conflict over the future, and preventing this may seem an unsurmountable task – after all, what can individuals do to stop China and India from fighting over water, or Yemenis from warring over starvation? Many supermarkets mainly sell unsustainable products. Often, they come from civil-war locations, are produced under exploitative circumstances, and are produced at cheap prices by excessive use of pesticides which travel through the soil into waters. The disregard of the current economic system for the environment has terrible consequences for human lives, and we are late to realize the scope of consequences. Governments through various climate agreements have agreed to reduce their negative impact on the environment, but while companies and energy sectors are being somewhat regulated, us consumers are not being guided very well in pursuit of more ethical consumption. As long as supermarkets offer what they do, it is understandable that consumers will not ride their bike all the way to the closest organic, waste-free market, or choose the more expensive milk or bread. Why do we buy it? – Meat for many people is an important source of protein. It is certainly important in vulnerable regions of the world. However, in other regions it has become a commodity. Why is it bad? – Meat comes from animals that have to be fed, that need land, and that require energy. To generate this energy, resources are needed, some of which are finite. The amount of energy and water put into meat is disproportionately high compared to the energy that is left in the final meat product. How can we act to reduce the potential for conflict over resources? – Reducing the consumption of animal products is the easiest and most effective way to halt the destruction of the planet, and thus prevent conflicts over resources from happening. Why do we buy it? 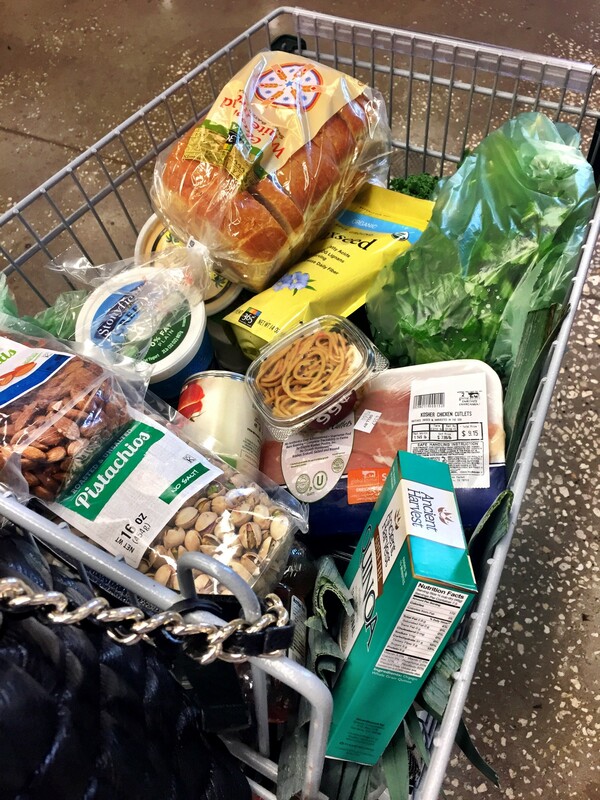 – The owner of the shopping cart decided to buy bread, salad, cream cheese, noodles and much more in plastic wrapping. Many of these products only come in plastic packaging. Plastic is argued to keep food clean, and can increase the shelf life. Offices tend to use plastic cups or plates, or provide small plastic spoons to stir coffee. Why is it bad? – First, these products are shipped from far, which requires energy and produces emissions. Second, plastic does not dissolve, and when not recycled properly, it enters into the food chain. Therefore, important links in the food chain are missing, and the ecosystem is slowly being killed from within as substitutes run out. Finally, plastic in many regions of the world is burnt instead of being recycled, as this is cheaper in production. The burning of plastic releases toxins which are inhaled – cities such as New Delhi and Beijing are extreme examples of how such pollution can turn into deadly smog. How can we act to reduce the potential for conflict over resources? – The easiest steps are using reusable bags. Say “no” to straws, bring your own cutlery, or volunteer to do the washing up at your office. Many internet guides exist on reducing plastic consumption, and the feeling of living nearly waste-free is incredibly liberating. Food can be prepared at home, which also saves money, and using food-sharing systems can help decrease the risk of food going bad. Soy, pistachios, almonds and avocados. Why do we buy it? – Soy milk is a good substitute for cow milk, which many environmentally conscious people prefer. Nuts are a good source of nutrients, and the popularity of avocados has increased in recent years. Why is it bad? – Often, rainforests are destroyed to make room for soy products. The land, however, frequently belongs to indigenous populations, whose fundamental rights are being violated. In removing them from the land, governments and companies often use force, sparking conflict. The products themselves require insane amount of energy and water, worse even when they are not in season and need to be grown under artificial conditions. They therefore use up disproportionately many resources for only a little amount of end-products. How can we act to reduce the potential for conflict over resources? – Oat milk is a delicious and less energy-consuming alternative to soy milk. It can also be easily made at home. Why do we buy it? – Leftover food is often preserved in tin foil, and tin cans with beans or tomatoes allow food to stay good for months. Why is it bad? – Aluminium is a finite resource that sparks conflict in regions such as the Democratic Republic Congo. Child labour and worker exploitation occur just as much as wars between militias about the valuable resource. As neither are biodegradable, they seriously pollute the environment and waters that people fish in for their livelihoods. How can we act to reduce the potential for conflict over resources? – Food also stays good if we put it in containers instead of aluminium, tin foil or plastic foil. The single most effective way to reduce our tendency to buy products that fuel civil wars and fights over livelihoods is to combat our general consumerism. The tendency to spend on leisure products and indulge on items that are not actually essential leads us to buy whatever is offered to us and to prefer cheap items over ethical ones. I personally urge governments to act and impose restrictions on the available products in shop and incentivize a lifestyle that is long overdue. Until then, it seems to be left up to us to act according to the urgency that is required. For any questions or inspiration on reducing waste and becoming a more ethical consumer, please contact Alena at The Hague Peace Projects.